September means back to school for kids and adults. Sometimes to move further in your business, you may need to take a class or two. However, experience is often the best teacher. There is value in your years of experience and passion, and this fall you may want to teach a class instead of taking a class. It really doesn’t matter if you are an expert in knitting or networking, there is probably a place where you can teach what you know. Check online for continuing education programs at community centers, colleges, conferences, writing schools, senior centers, nonprofit agencies and see where can teach. Ask around or even consider teaching someone in exchange for other business services that you need. If money is not an issue, consider volunteering your services and sharing your knowledge with others. Teaching is one the best ways to validate your expertise to others. Originally uploaded by Busy Baking. 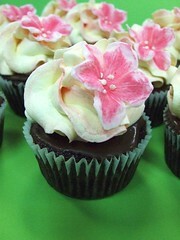 The Fourth Annual Cupcakes For A Cause is October 15 through October 21. This is a fun weeklong event in which participating bakeries and stores across the US will sell specially decorated cupcakes and donate a portion of the proceeds from their sale to CancerCare for Kids. In addition, companies and individuals are also invited to sponsor bake sales to help raise funds for the program. Cupcakes Take The Cake Blog that I run with my friends, Allison and Rachel. Bookkeeping Tip: If you make donations to this or any other charity, make payment via credit or debit card or get a receipt if it a cash donation. Conferences are great way to meet new people, develop new business and market yourself. There are two upcoming conferences this fall that you want to check out. The New York Times and American Express’ Open is hosting a Small Business Summit on October 10 at the Sheraton New York. Keynote Speakers are Danny Meyer of the Union Square Hospitality Group and Tom Scott of Nantucket Nectars and Plum TV. Registration is open and the fee is $99. The New York XPo for Business is more of a small business trade show. There will also breakout on technology, small business financing and healthcare. The even is Wednesday November 28. Registration is open and it is free to attend, but it costs to be a vendor. I attended this last year, and it was informative, but there is more of an emphasis on selling services. Selling products is quick and easy, but you may want to review the legal aspects of selling online. Safeselling.org offers a resource for business people launching ecommerce enterprises and for businesses venturing into online sales. First-time entrepreneurs and established small to medium-sized business expanding their horizons should find helpful information on this site about selling goods and services online. And if you are fed up with eBay fees, then you want to try selling on eCrater. It’s plastic and it’s green! There is a green credit card called GreenPay which is made of out recycled plastic. I am not sure how much this helps the environment, but I applaud Mastercard for taking a step in the right direction. BTW, if you do get the card, request that you get credit card statements emailed to you and pay online to reduce paper.